Goodreads says, "In love we find out who we want to be. In war we find out who we are. FRANCE, 1939 - In the quiet village of Carriveau, Vianne Mauriac says goodbye to her husband, Antoine, as he heads for the Front. She doesn’t believe that the Nazis will invade France...but invade they do, in droves of marching soldiers, in caravans of trucks and tanks, in planes that fill the skies and drop bombs upon the innocent. When France is overrun, Vianne is forced to take an enemy into her house, and suddenly her every move is watched; her life and her child’s life is at constant risk. Without food or money or hope, as danger escalates around her, she must make one terrible choice after another. Vianne’s sister, Isabelle, is a rebellious eighteen-year-old girl, searching for purpose with all the reckless passion of youth. While thousands of Parisians march into the unknown terrors of war, she meets the compelling and mysterious Gäetan, a partisan who believes the French can fight the Nazis from within France, and she falls in love as only the young can...completely. When he betrays her, Isabelle races headlong into danger and joins the Resistance, never looking back or giving a thought to the real--and deadly--consequences." War is looming in France and the year is 1940. Viann has to say goodbye to her husband as he is off to fight against the invading German army. She hopes that he will return soon to their provincial life on a small farm in the Loire Valley. They have one daughter together, Sophie, and Viann leads a rather average life as a schoolteacher. This all changes when her estranged sister, Isabelle, shows up from Paris, along with many other people fleeing from the Germans. Their father has sent Isabelle to live with Viann as Paris is no longer safe, but Isabelle isn't your usual girl. She has been thrown out of many prestigious schools, is feisty, opinionated, restless and not easily controlled. This becomes a problem as Viann's town has been taken over by the Germans. In fact, a German officer has to stay in their house, which makes things rather dangerous for the two women. Isabelle realizes that she can't sit by and watch horrible things happen to her country and her people, so she becomes a part of the Resistance. This puts her sister and niece in a precarious situation, so she knows it is time to leave them and head back to Paris in order to play a stronger role in the Resistance. Although Viann doesn't play a very active role in the Resistance as Isabelle, she too has many important decisions and sacrifices to make during wartime. The two women's journeys stayed with me long after I finished the novel. Weeks later, I am still thinking about this book. 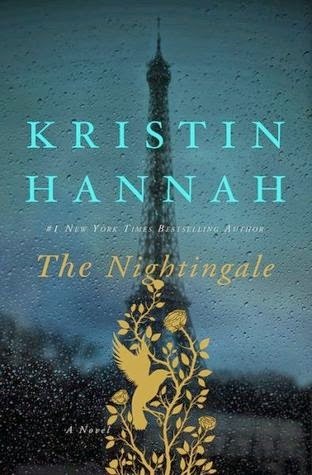 Kristin Hannah has hit a home run with The Nightingale. It's a powerful and important read about what life was like during World War II and how many women played important roles in the war, but often their stories go untold. I could see many readers getting frustrated with Viann in the beginning of The Nightingale, but I could totally understand why she acted more passively than her sister, Isablelle. She has a daughter to take care of and a German officer living in her house, so she had much, much more to lose. As time went on, Viann finds other ways to "resist." I could really feel for Viann and the various situations she was put through had me reeling. Between the food rationing, the German army's unnecessary violence, the constant state of anxiety, her Jewish neighbors being deported to concentration camps, not hearing from her husband, etc. It all broke my heart bit by bit. Her journey was gut wrenching, but I feel like it was an accurate portrayal of wartime and the quiet sacrifices that some women had to make. Isabelle is a foil of her sister in The Nightingale. She is more outlandish, more outwardly brave, to a fault at times. She gets herself into some dangerous situations and throws caution to the wind quite often. Her part in the resistance was heroic, but very dangerous, so I was constantly on the edge of my seat with worry for Isabelle. It is clear The Nightingale is a well researched tale that truly reminded me of the many sacrifices women made during the war that history often forgets. Sure women weren't fighting physically (for the most part), but many women were part of the Resistance and oftentimes we don't get to hear about their heroics. I love how Hannah reminds us of this. I've always been really interested in World War II (after teaching Anne Frank's The Diary of a Young Girl for so many years), so needless to say, I was completely glued to The Nightingale. I can't tell you how many times I cried when I read it. I was so invested in Viann and Isabelle's lives. Every setback they experienced, I experienced along with them. As a mother and a human being, I can't imagine how the Gestapo and SS did what they did. Certain scenes left me in a pool of tears, especially when dealing with how the Jewish people were mistreated, separated from their families, and babies left behind or worse yet, taken with them to the concentration camps. It was gut wrenching, but an important reminder of the horrible crimes committed that shouldn't be forgotten. If you like historical reads that will leave you shaken to the core, then I highly recommend The Nightingale. I can't say enough things about this book. And it isn't all doom and gloom. The Nightingale leaves us with immense hope and reminded me of what Anne Frank said, "Despite everything, I believe people are really good at heart." Yes, yes, and yes! I found this to be a very moving story. Isabelle and Vianne ended up being pretty indelible characters and I loved the way Kristin Hannah gave voice to those nameless women in history who made such sacrifices during war. Me too. I am so glad you agree and enjoyed this book as well. Such a great read! Thanks for visiting! Thanks, Joy! I hope you do! It was an awesome read. Thanks for dropping by. I loved this book! I recently read "All the Light We Cannot See" by Anthony Doerr, which is also set in WWII France, and is simply fabulous. I didn't see a review of it in your archive list, so you may not have read it yet. Happy reading! Thanks for the recommendation. I will definitely check it out…love the setting of WWII. Thanks for visiting! This book has been on my radar for a while, and I can't wait to read it. I'm so glad you enjoyed it! It's an awesome read…very powerful, so I hope you get to read it soon. Thanks for visiting, Allison. I am back to reading The Nightingale again and I'm on pins and needles for Viann and Isabelle. This book reminds me a little of The Girl You Left Behind by Jojo Moyes but The Nightingale is even better. Glad to hear you loved this book. I agree that it was hard at first to see how Viann reacted but I think her portrayal is historically accurate and very realistic. I can't wait to hear your thoughts on it. I was on edge of Viann and Isabelle as well. I think you are right about Viann's portrayal. I can tell Hannah put a lot of research in this book. Thanks for visiting, Christina!